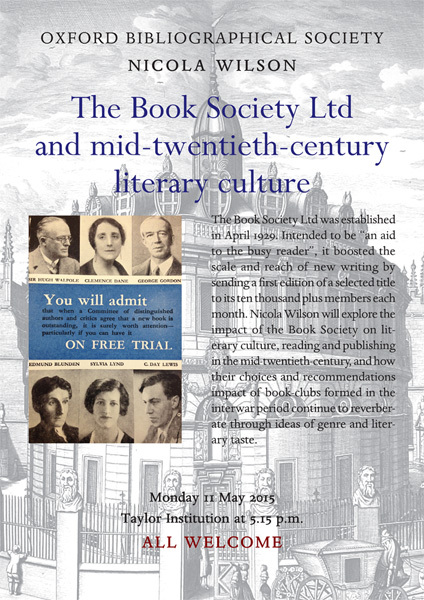 Modeled on the successful Book-of-the-Month Club in America, the Book Society Ltd was established in April 1929 by the novelist Hugh Walpole and rapidly became a formidable force in literary and publishing circles. Aiming to be “an aid to the busy reader”, it boosted the scale and reach of new writing by sending out a full-price first edition of a selected title to its ten thousand plus members each month. Drawing upon the early stages of archival research in attempting to flesh-out the history of this now little-known but influential book club, this paper will explore the impact of the Book Society on literary culture, reading, and publishing in the mid-twentieth-century, considering both the breadth of its choices and recommendations and its self-fashioning as a defender of middlebrow reading patterns. Considering wider transitions in distribution, book-buying and reading cultures during this period, as newly published books started to become more affordable and there was a shift towards greater book-buying in the public, it will examine how the Book Society sought to encourage the reader to invest in new books as markers of distinction and taste. What was the impact of newly-formed book clubs like the Book Society in the interwar period and how do their choices and recommendations continue to reverberate through ideas of genre and literary taste?